During the 1860s short-lived imitations of the British humour and satirical magazine Punch began. The first was the fortnightly Taranaki Punch (1860–61), followed by the weeklies Canterbury Punch (1865), Otago Punch (1866–67) and Auckland Punch (1868–69). Their cartoons sent up local politicians and contributed to the creation of stock colonial types, such as the raffish but enterprising pastoralist. The Dunedin-produced weekly New Zealand Punch published a few issues in 1888. 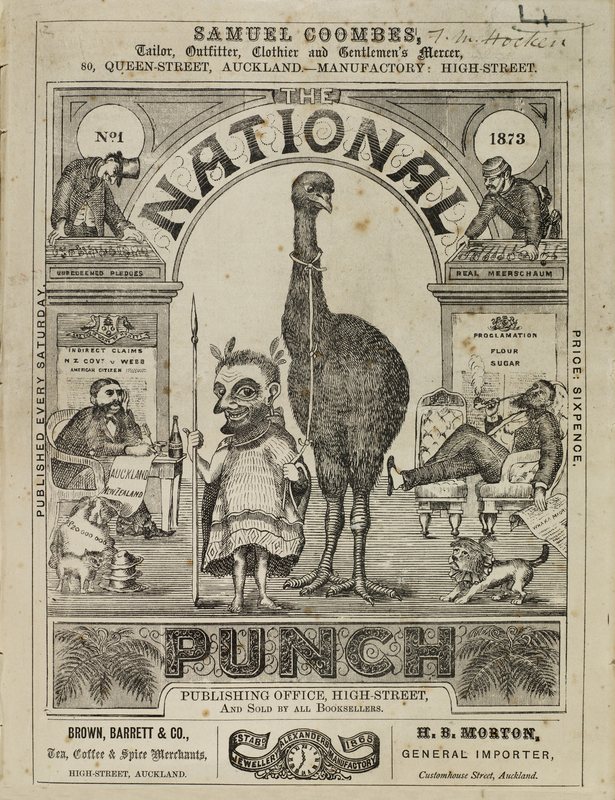 National Punch was a periodical that started on 25 October, 1873, and finished on 17 January 1874; 12 issues in all. Published by George McCullagh Reed (1831/2-1898) and Henry Brett (1843-1927), and printed at Evening Star Office. Cost 6d per copy; 5s per quarter. According to references in the Star, the publishers had no input into the content of this short-lived satricial magazine. George McCullagh Reed (1831/2-1898) and Henry Brett (1843-1927), publishers, “The National Punch, 1,” ourheritage.ac.nz | OUR Heritage, accessed April 26, 2019, http://ourheritage.ac.nz/items/show/10863.